(A) GSK3 inhibitors have specific effects on early wild-type zebrafish development when treatment occurs between 4 and 24 hpf. LiCl treatment caused strongly reduced eye formation (black arrowheads), while SB-216763 and SB-415286 also perturbed formation of brain, somites, and tail (gray arrowheads). In addition to these phenotypes, AR-534 also caused multiple ear formation (arrowheads in enlargement). In contrast, AR-164, which has in vitro activity comparable to that of AR-534, did not cause any detectable change in phenotype even at 4-fold concentration. Embryos injected with dN-GSK3β mRNA to suppress the function of endogenous GSK3β phenocopied alterations of compound-treated fish; however, only AR-534 was potent enough to phenocopy the ear multiplication seen in embryos expressing high levels of dN-GSK3β (arrowheads in enlargement). Embryos injected with wild-type GSK3β did not display a phenotype at comparable mRNA concentrations. Scale bars: 500 μm; 100 μm (insets). 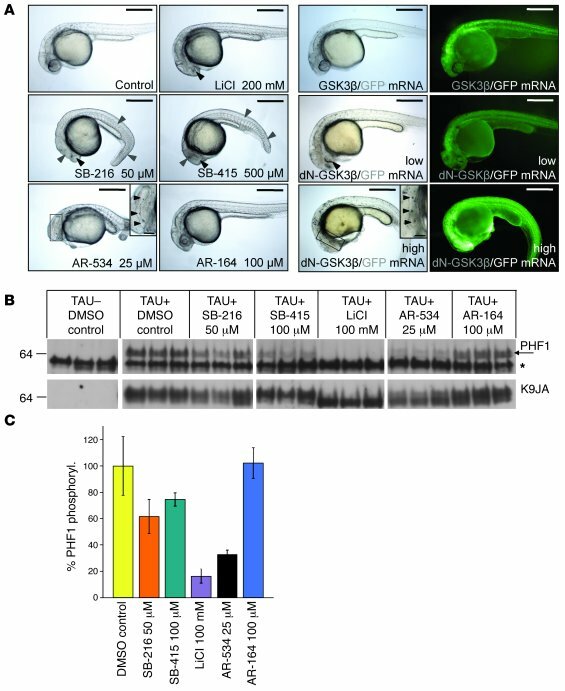 (B) GSK3 inhibitors reduce pathologic TAU phosphorylation in vivo when applied to TAU transgenic fish between 20 and 100 hpf. Phosphorylated TAU was detected by WB using antibody PHF1 and normalized to total TAU (K9JA). The band intensities were compared with a DMSO control on the same gel. The upper specific PHF1-band (arrow) was quantified. As already shown in Figure 2, the lower PHF1 band was unspecific (asterisk). (C) Quantification of WB band intensities of phospho-specific TAU as a percentage of the total amount of TAU detected by K9JA shown in B.